I love bathroom designs like this that showcase some sort of unique statement piece. Too often master baths feature boring monochromatic color palettes with neutral finishes. I understand that you need to keep things simple in order to keep your home attractive for resale, but sometimes this is simply no fun. We are about to embark on a bath remodel, and I want to incorporate a similar feature into our design. I actually think it would not be that expensive to add an element like this because, although it is a bold look, it is simply decorative tile installed on the floor rather than walls. 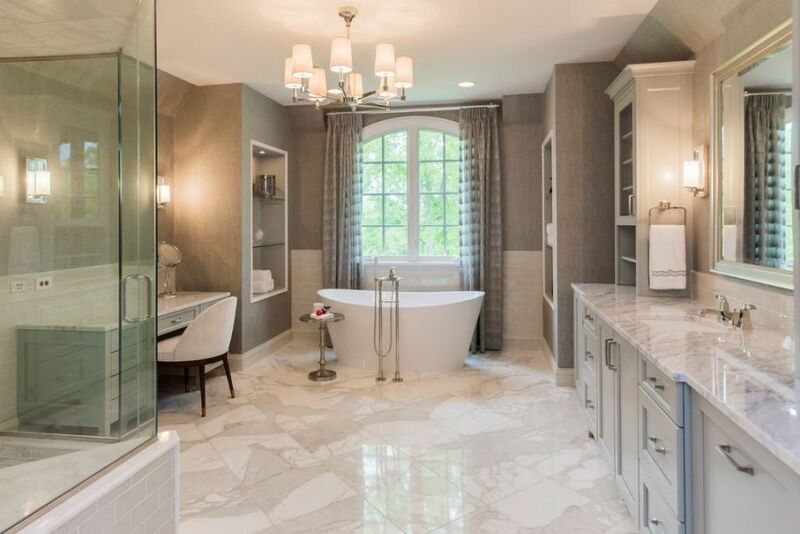 Furthermore, if I keep the rest of the bathroom makeovers pretty tame in design, I don’t think that a decorative floor would turn buyers off that much. 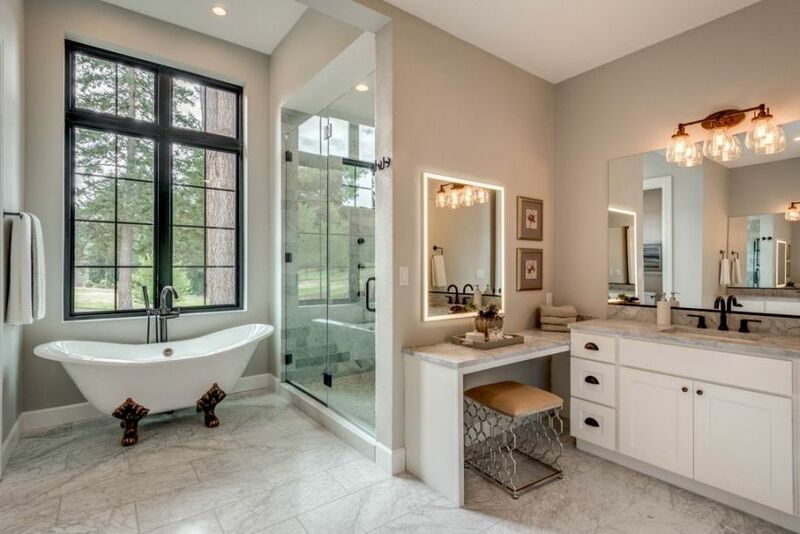 Bathroom makeovers are one of those projects that are often on the top of people’s lists because they are a key component of increasing the value of your home and making it more attractive to buyers. They can be a bit daunting because the average bathroom remodel cost is not cheap. 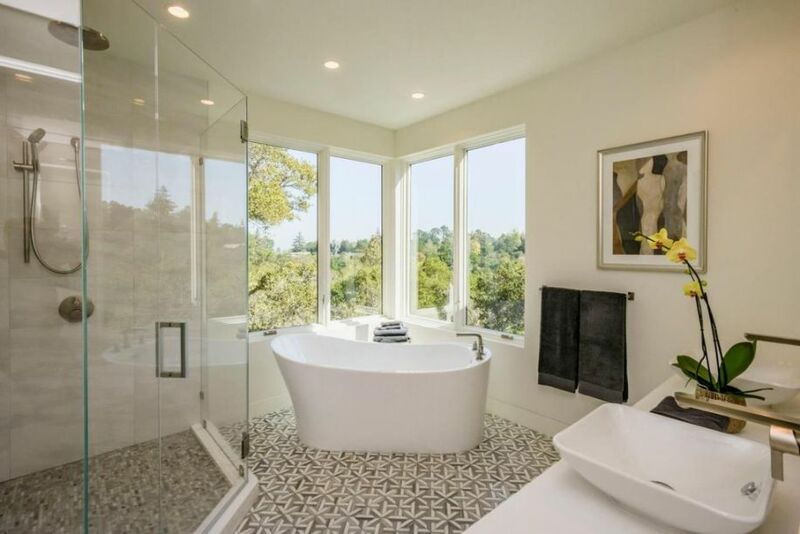 Because of the costly elements incorporated in designing this space — tubs, tile, vanities, countertops, fixtures etc. — it is important to have a plan and a budget in mind before starting. Keep in mind that you do not have to go all out and create a high end designer space like this gorgous home. However, you can take ideas and inspiration from images like this and incorporate them into your bathroom renovations. Homeowners are frequently intimidated by bathroom makeovers because they often feel that you have to change every element of the existing space. This is simply not true. There is no reason to swap out tile or vanities if you like their style. Just like it is not necessary to change the bathroom layout if the traffic flow works well and there is sufficient functionality. Simple changes like revamping paint colors or switching out fixtures and knobs can make an enourmous difference to the overall style of the space. Even better, small modifications like these can keep the bathroom remodel cost quite low. 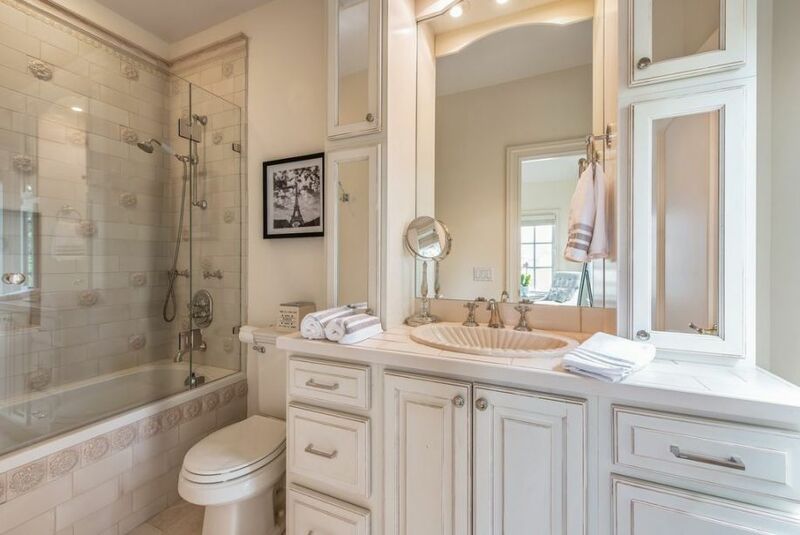 Check out this recently renovated master bath for examples of what I am talking about. The first question our clients ask us when we sit down to discuss a design project is what will a bathroom renovation cost us. Unfortunately that is a hard question to answer because it all depends on the room you start out with, and what you want it to look like once it is complete. If your motivation is to keep the price of your bathroom makeovers low, I do have a few tips for you. First and foremost, recycle existing decorative features whereever possible. Tile and cabinetry tend to be the most expensive items of a bathroom remodel. If you can reuse them in some way, you will save yourself a ton. There are small bathroom makeovers that you can do to give new life to old pieces. One of the projects that our company gets most frequently is bathroom makeovers. I think that this room intimidates homeowners (rightfully so) and they don’t feel as confident with do it yourself projects in here. These are photos of a recent master bathroom remodel that we took on after our client attempted to complete the work himself. Before we were called, he ripped out the existing tile floors and their old countertops. But once it came time to replace the flooring and add the wall tile, he was stumped. We always recommend consulting a professional — even if it is a pro at your local home improvement warehouse — before taking on tile work. They even offer classes you can take if you are committed to doing it yourself. Eye catching bathroom shower designs are essential to creating a master bath with the wow factor that sells homes. This home now has just that. Before we remodeled the space it was dingy and outdated, with dark wood cabinetry and boring travertine tile. In anticipation of selling our home sometime in the next 5 years, we knew that we would have to revamp this space in order to get the maximum return on our investment. I added his and hers bathroom vanities with coordinating marble countertops, and a glamorous chandelier to really cement the luxe look we were going for. As I began looking into bathroom makeovers, I realized that there are a few trendy things that seem to be selling homes these days.